The government issued an order saying that journalists could be denied government access or PIB accreditation on the accusation of fake news. However, later the press release was withdrawn as the PM said that fake news issues should be handled by the Press Council of India. Is the government looking at ways to gag the press? 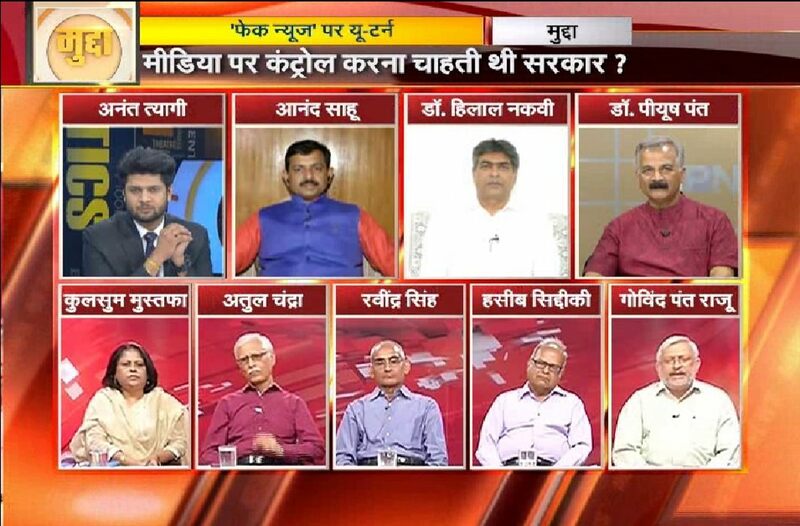 The issue was discussed at APN’s popular debate show, Mudda, with panellists including BJP’s Anand Sahu, Congress’ Dr Hilal Naqvi, noted journalists Atul Chandra, Ravindra Singh, Haseeb Siddiqui, Kulsum Mustafa and Dr Piyush Pant, and APN consultant Govind Pant Raju. Anchorperson Anant posed the first question to Sahu who said that “democracy entails responsibilities. Rights and duties go hand in hand. Even the SC has stated that Dalit cases need to be examined before they are filed, so things can’t be taken at face value.” Anant said Sahu is clubbing two different issues together. Pant said that it’s obvious that the government effort was to muzzle the press. “The government feels the ground slipping, so the effort was to gag the press,” he said. Chandra said FB and Twitter routinely post fake news. Sahu said rumour mongering has become common. On Naqvi’s asking, he said, both Modi and Irani are right, even though Irani announced the order and the PM scrapped it. “How is the PM responsible for SSC paper leak?” he asked. Pant said ministers tend to go overboard at times. Sahu said the power of pen and camera entail responsibility. Raju said journalism is not just any profession, it’s the fourth pillar of democracy. Chandra said “the media too needs to introspect”.